Carbon Steel Pipe, Carbon Steel Welded Pipes, Carbon Steel Seamless Pipes, Carbon Steel A53 Pipe Exporter in Mumbai, ASTM A333 Pipes, ASTM A106 Carbon Steel Pipes Manufacturer in Mumbai, India. ASTM A106 Carbon Steel Pipe, Carbon Steel Rectangular Pipe, ASTM A 106 Carbon Steel Pipes Dealer, Carbon Steel Welded Pipes Exporter, Carbon Steel Square Pipe Suppliers and Exporters in Mumbai, India. Ganpat Industrial Corporation is one of the pioneer manufacturers & exporter of CS Pipes, which is available in different sizes and shapes to our customers. Strengthening of these Carbon Steel Welded Pipes is further enhanced by aging the cold – worked structure near 1000 Degree F (540 Degree C) for a period of 4 hours to 16 hours. The high nickel and chromium contents make our Carbon Steel EFW Pipes resistant to a variety of both reducing and oxidizing media. The aluminium, in conjunction with the chromium, provides oxidation resistance at high temperatures in these Carbon Steel ERW Pipes. Solid – solution strengthening of our Carbon Steel Round Pipes is imparted by the cobalt and molybdenum. This combination of treatments increases both the room and elevated tensile strength of these Carbon Steel Square Pipes. Cold working prior to aging in our Carbon Steel Rectangular Pipes significantly increases the rate of the aging reaction. The combination of high strength and oxidation resistance at temperatures over 1800 Degree F makes these Carbon Steel Pipes an attractive material for such components as ducting and combustion cans. We also offer the same in different grades and types such as Carbon Steel Seamless Pipe, Low Temperature CS Seamless Pipes, ASTM A53 GR. B Carbon Steel Pipes, ASTM A106 GR. B Carbon Steel Pipes, and ASTM A333 GR 6 Carbon Steel Pipes. Meanwhile, these Carbon Steel Hexagonal Pipes has excellent resistance to carburization. Carbon Steel Welded Pipes Stockist, Carbon Steel API5L Pipes Exporter, A106 CS Seamless Pipes, CS Pipes, Carbon Steel Black Round Pipes Manufacturer in India. 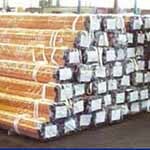 Carbon Steel Pipe may be furnished bare or coated and with capped ends. pipes up to 3” OD will be supplied in bundles. In order to prevent rust during sea shipment, bundles of Carbon Steel Seamless Pipe may be wrapped with polypropylene sheets, and secured with flat steel bands. Over 3” OD will be supplied loose. Chennai, Sydney, Ahmedabad, Kuwait City, Surat, Ulsan, Colombo, Al Khobar, Pimpri-Chinchwad, Ranchi, Ernakulam, Mumbai, Howrah, Ankara, Baroda, Singapore, Al Jubail, Karachi, Calgary, Vadodara, Atyrau, Thiruvananthapuram, Kuala Lumpur, Port-of-Spain, Bhopal, Madrid, Doha, London, Dubai, Kolkata, Navi Mumbai, Faridabad, Secunderabad, Moscow, Rio de Janeiro, New Delhi, Bangkok, Cairo, Jeddah, Jamshedpur, Haryana, Riyadh, Lagos, Nashik, Dammam, Courbevoie, Dallas, Bengaluru, Bogota, Rajkot, Muscat, Hong Kong, Chiyoda, Visakhapatnam, Mexico City, Seoul, Granada, Gurgaon, Houston, Sharjah, Aberdeen, Nagpur, Edmonton, Thane, Gimhae-si, Brisbane, Vung Tau, Ho Chi Minh City, Chandigarh, Algiers, Toronto, Jakarta, Lahore, Busan, Ahvaz, Hanoi, Noida, Hyderabad, Montreal, Indore, Pune, Abu Dhabi, Geoje-si, La Victoria, Caracas, Perth, Tehran, Jaipur, Manama, Melbourne, Coimbatore, Istanbul, Kanpur, New York, Ludhiana, Los Angeles, Milan, Santiago, Petaling Jaya. Pakistan, Slovakia, Estonia, Nigeria, Kuwait, South Africa, Israel, Australia, United Kingdom, Poland, Iran, Russia, Bangladesh, Egypt, United Arab Emirates, Singapore, Chile, Iran, Hong Kong, Yemen, Turkey, Italy, Switzerland, Taiwan, South Korea, Kenya, Bulgaria, Colombia, Mexico, Bhutan, Qatar, New Zealand, Belarus, Bolivia, Puerto Rico, United States, Angola, Macau, Jordan, Netherlands, Iraq, Mexico, Argentina, Zimbabwe, Tibet, Ghana, Germany, Lebanon, Namibia, Sweden, Libya, Portugal, Indonesia, Belgium, Greece, Sri Lanka, Nigeria, Japan, Romania, Venezuela, Poland, Saudi Arabia, Spain, Thailand, Denmark, Gabon, Gambia, Austria, Ukraine, Bahrain, France, Ireland, Afghanistan, Morocco, Ecuador, China, Brazil, India, Mongolia, Croatia, Philippines, Lithuania, Oman, Peru, Costa Rica, Trinidad & Tobago,Tunisia, Hungary, Canada, Czech Republic, Norway, Serbia, Malaysia, Chile, Algeria, Vietnam, Finland, Azerbaijan, Nepal, Kazakhstan.